Copenhagen, Denmark - "Anti-terror" police raided a youth community center in the Noerrebro district of Copenhagen. The Ungdomshuset (Youth House) was originally occupied by squatters in 1982 but the center was granted permission to stay by the City Council soon after. Police evicted the residents on behalf of a fundamentalist Christian sect, who the city sold the building to six years ago. The church plans to demolish the building. During the raid authorities say they uncovered a large stash of iron bars, sling shots, fireworks, firebombs and a flame thrower. Police entered the four story building through the roof after they lowered themselves down from a helicopter. Police were able to take control of the building, but more than 1,000 squatters and their supporters soon took control of the surrounding streets. Protesters built flaming barricades out of dumpsters, over turned cars and other debris. They also attacked police with molotov cocktails, rocks, fireworks, smoke bombs, clubs and other projectiles. 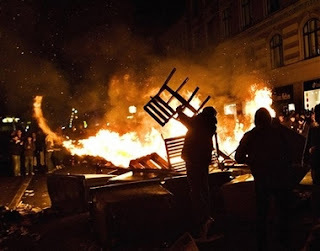 Police fired teargas and attempted to disperse rioters who fell back to the nearby Christianshavn district adjacent to the autonomous Freetown of Christiania. Christiana itself was squatted in '70s and it's residents are regularly threatened with eviction. Violent clashes have continued into the early hours of Friday morning. Police from other agencies around Denmark are on their way to help put down the violence and have re-established border controls to prevent multitudes of squatters from other countries, in particular Germany, from reaching Copenhagen. According to Merima Lulic, a police spokesperson, three men were arrested in the southwestern Swedish city of Malmo, while transporting flammable material and explosives. The three were thought to be headed for Copenhagen. Over 250 have been detained so far, 35 on serious charges such as assaulting police officers or illegal trespassing. Several of those are foreign nationals including nine Germans, two U.S. citizens, two Poles, and a French national, the Danish news agency Ritzau reported. Last December supporters of the center held a similarly destructive large scale demonstration. Following those riots a U.S. citizen was deported. A solidarity demonstration in Oslo, Norway attracted some 150 protesters who threw projectiles such as paint bombs at the Danish embassy. No arrests were made. Police in Stockholm, Sweden said that they were bracing for their own solidarity demonstration.